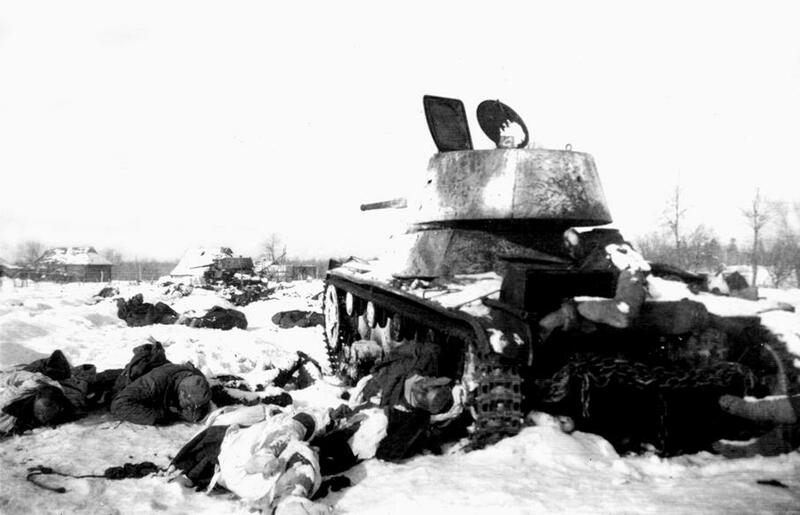 Operation Spark – The second Battle of Lake Ladoga, January 1943. Experiences of a German Division. On the 12th of January 1943 my grandfather (4./Füsilier-Regiment 22) was buried alive when a soviet artillery shell exploded close to his dugout. The explosion made his eardrums burst, he had a severe concussion of the brain and spent the next 15 hours buried under meters of earth in total darkness. When night set in his comrades managed to dig him out. This frightening experience changed him forever. It was the first day of what became known as the “Second Battle of Lake Ladoga”. Even if its bloody long already, this article is not completed yet. More details and reports will be added when I find the time. In the next series of posts I am going to offer a closer look on the Second Battle of Lake Ladoga and 1st Infantry-Divisions role in it. 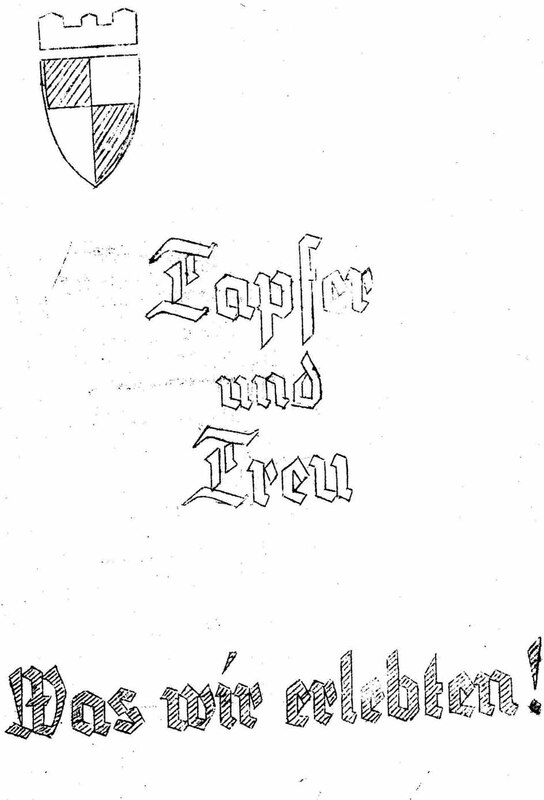 To do thistranslated official battle reports and eye-witness accounts found inside tthe war diaries of the german 1st Infantry Division and other german sources. But first, as usual, let’s have a look at the general history of the battle. 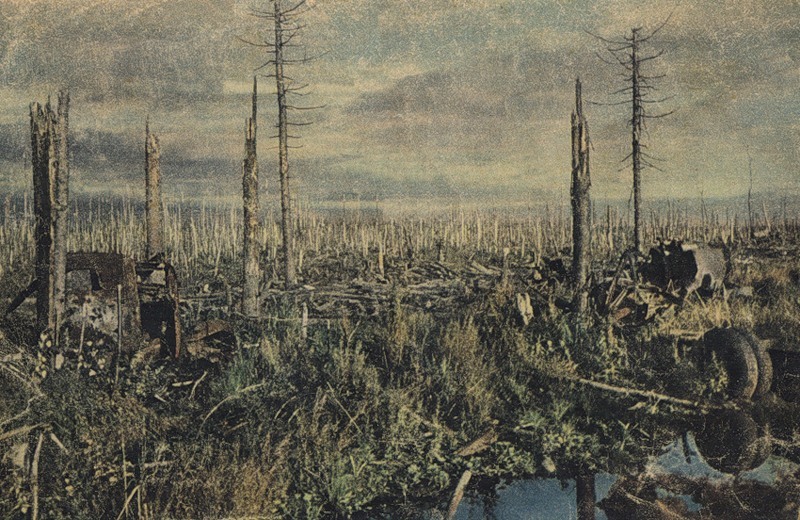 The second Battle of Lake Ladoga; Operation Iskra (Russian: операция «Искра», operatsiya Iskra; English: Operation Spark) was a Soviet military operation during World War II, designed to break the German Wehrmacht’s Siege of Leningrad. 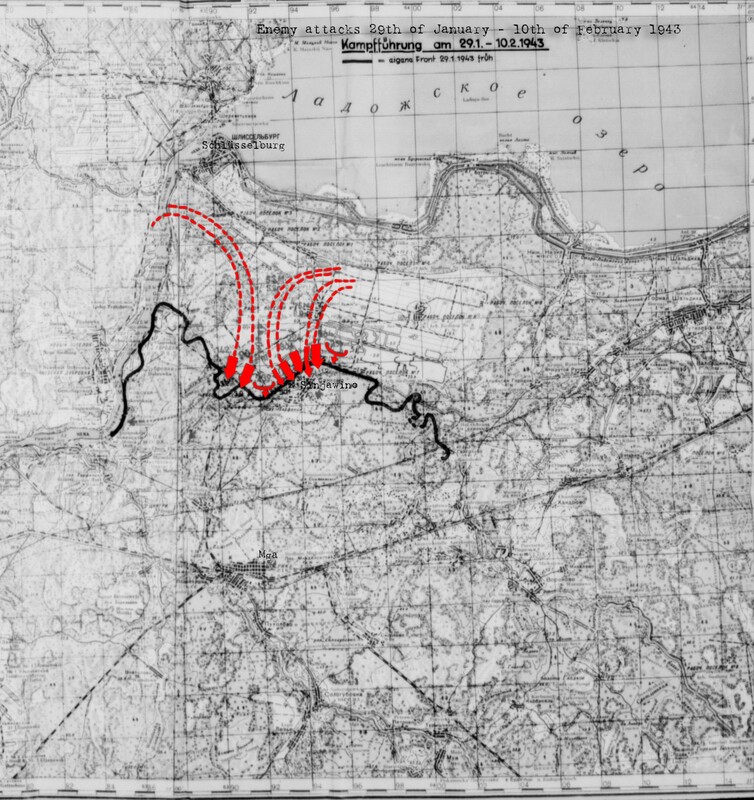 Planning for the operation began shortly after the failure of the Sinyavino Offensive. The German defeat in the Battle of Stalingrad in late 1942 had weakened the German front. 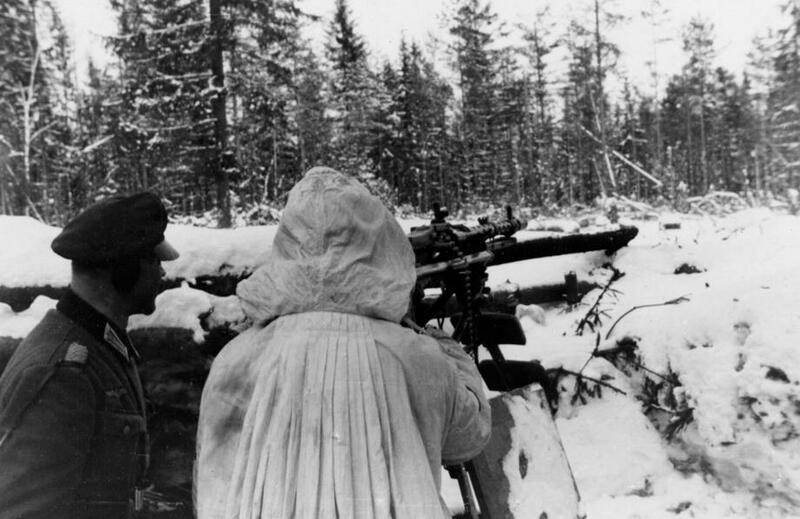 By January 1943, Soviet forces were planning or conducting offensive operations across the entire German-Soviet front, especially in southern Russia, Iskra being the northern part of the wider Soviet 1942–1943 winter counter offensive. 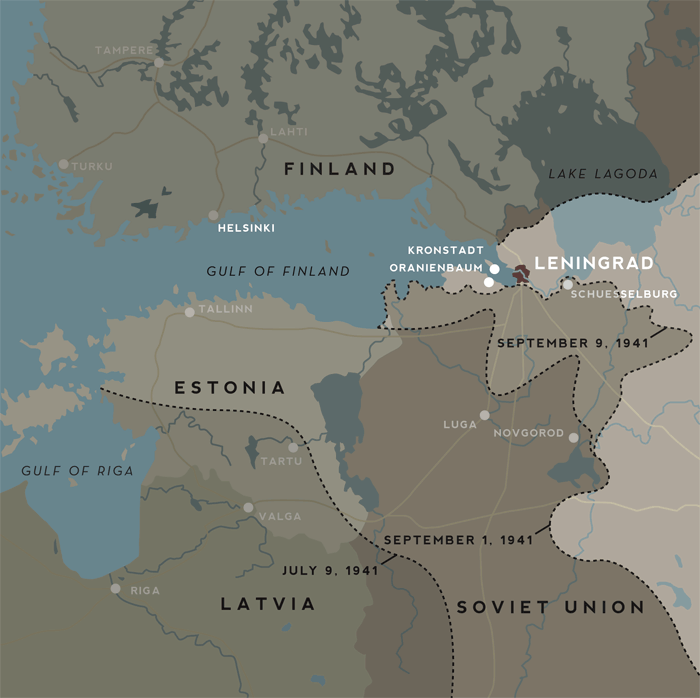 The operation was conducted by the Red Army’s Leningrad and Volkhov Fronts, and the Baltic Fleet during January 12–30, 1943 with the aim of creating a land connection to Leningrad. The Soviet forces linked up on January 18, and by January 22, the front line was stabilised. The operation successfully opened a land corridor 8 kilometres (5.0 mi)–10 kilometres (6.2 mi) wide to the city. A rail road was swiftly built through the corridor which allowed more supplies to reach the city than the Road of Life across the frozen surface of Lake Ladoga, significantly reducing the possibility of the capture of the city and a German-Finnish linkup. The success led to a much more ambitious offensive operation named Polyarnaya Zvezda (Polar Star) less than two weeks later. That operation had the aim of decisively defeating Army Group North, lifting the siege altogether, but it achieved only minimal progress. Soviet forces made several other attempts in 1943 to renew their offensive and completely lift the siege, but made only modest gains in each one. The corridor remained in range of German artillery and the siege was only over on January 27, 1944. The siege of Leningrad started in early autumn 1941. By September 8, 1941 German and Finnish forces had surrounded the city, cutting off all supply routes to Leningrad and its suburbs. However the original drive on the city failed and the city was subjected to a siege. During 1942 several attempts were made to breach the blockade but all failed. The last such attempt was the Sinyavino Offensive. After the defeat of the Sinyavino Offensive, the front line returned to what it was before the offensive and again 16 kilometres (9.9 mi) separated Leonid Govorov’s Leningrad Front in the city and Kirill Meretskov’s Volkhov Front. Despite the failures of earlier operations, lifting the siege of Leningrad was a very high priority, so new offensive preparations began in November 1942. In December, the operation plan was approved by the Stavka and received the codename “Iskra” (Spark). The operation was due to begin in January 1943. By January 1943, the situation looked very good for the Soviet side. The German defeat in the Battle of Stalingrad had weakened the German front. The Soviet forces were planning or conducting offensive operations across the entire front, especially in southern Russia. 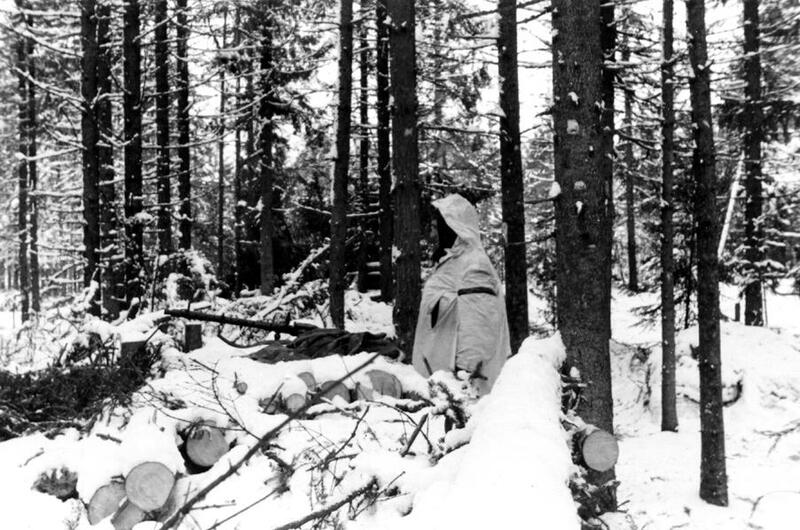 Amidst these conditions, Operation Iskra was to become the first of several offensive operations aimed at inflicting a decisive defeat on the German Army Group North. The area south of Lake Ladoga is heavily forested area with many wetlands (notably peat deposits) closer to the lake. In addition the forest shielded both sides from visual observation. Both of these factors greatly hindered the mobility of artillery and vehicles in the area, providing a considerable advantage to the defending forces. One of the key locations were the Sinyavino heights which were some 150 metres higher than the surrounding flat terrain, which were one of the few dry and clear areas, and in addition provided good observation. Since the front line had changed very little since the blockade was established, the German forces had built a dense defensive network of strong points, interconnected by trenches and protected by extensive obstacles and interlocking artillery and mortar fire. The Neva river and marshes were partially frozen in winter which allowed infantry to cross it, but not heavy vehicles. Die Deutsche Wochenschau 1943-03-17 – Contains footage showing fighting south of Lake Ladoga (Starting at 12:45). At the start of the Soviet offensive, the German 18th Army, led by Georg Lindemann consisted of 26 divisions spread across a 450 kilometres wide front. The army was stretched very thin and as a result had no division-level reserves. 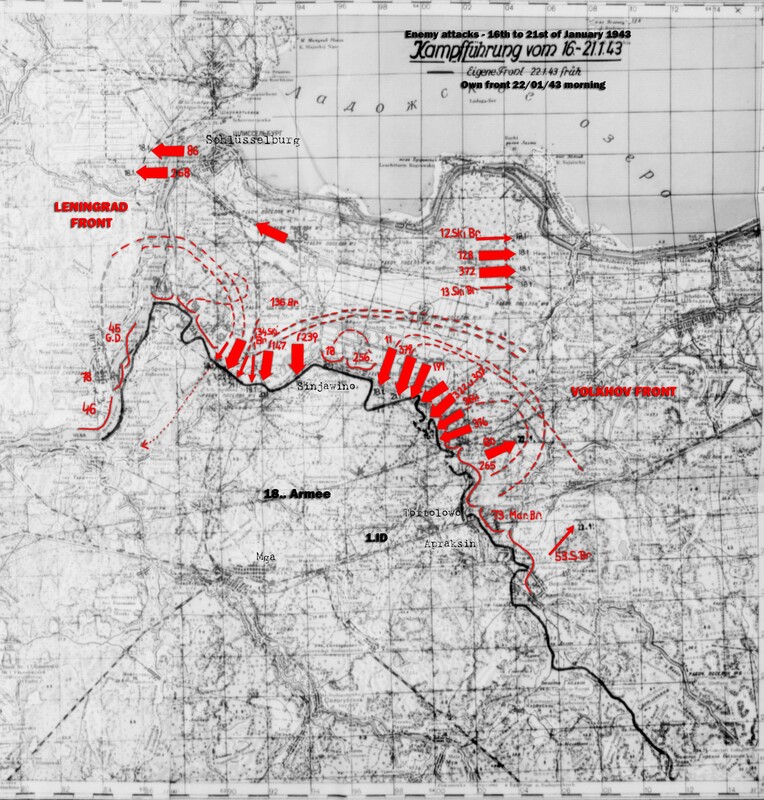 Instead, each division had a tactical reserve of one or two battalions, and the army reserves consisted of portions of the 96th Infantry Division and the 5th Mountain Division. The 1st Air Fleet provided the air support for the army. Five divisions and part of another one were guarding the narrow corridor which separated the Soviet Leningrad and Volkhov Fronts. The corridor was only 16 kilometres (9.9 mi) wide and was called the “bottleneck”. The German divisions were well fortified in this area, where the front line had been virtually unchanged since September 1941, and hoping to repel the Soviet offensive. This meant recapturing the “bottleneck” and opening a 10 kilometres (6.2 mi) corridor to Leningrad. 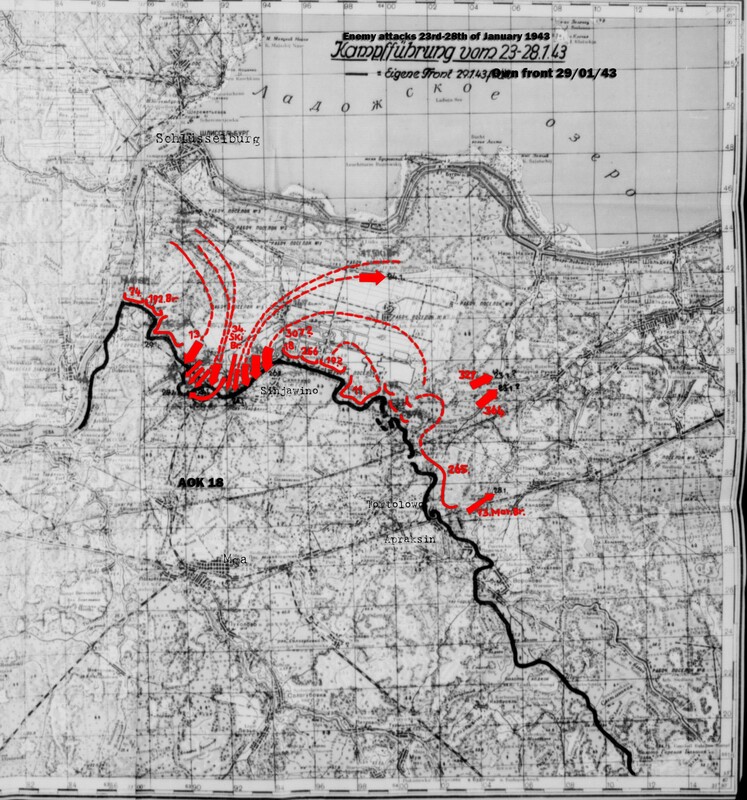 After that, the two fronts were to rest for 10 days and resume the offensive southward in further operations. The biggest difference from the earlier Sinyavino Offensive was the location of the main attack. In September 1942 the Soviet forces were attacking south of the town of Siniavino, which allowed them to potentially encircle several German divisions, but also left the army open to flanking attacks from the north, and it was this which ultimately caused the offensive to fail. In January 1943 the offensive was conducted north of Siniavino, closer to the Ladoga Lake shore, which removed the threat of flanking attacks and increased the probability of success, but forced the Soviets to abandon the idea of encircling most of the German forces in the “bottleneck”. The offensive was to be conducted by Leningrad Front’s 67th Army and Volkhov Front’s 2nd Shock Army commanded by Major General M.P. Dukhanov and Lieutenant General V.Z. Romanovsky respectively. The 8th Army, commanded by Lieutenant General F.N. Starikov, was to conduct a limited offensive on the 2nd Shock Army’s flank and defend elsewhere. 13th and 14th Air Armies provided air support. The two fronts spent December training and preparing for the offensive, and received significant reinforcements. 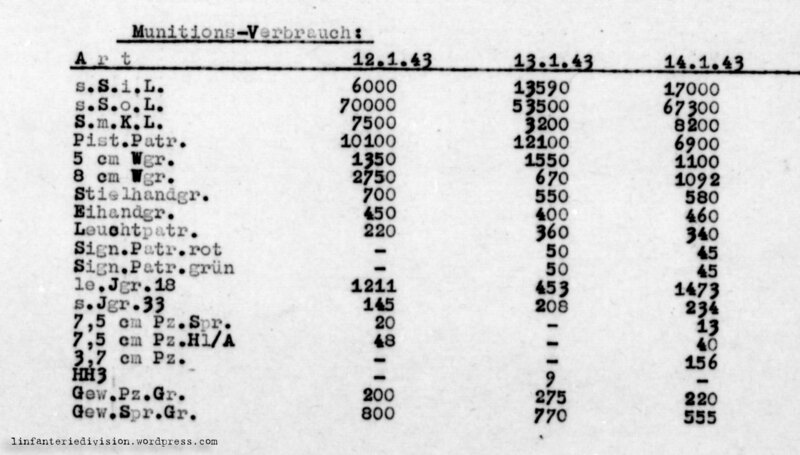 These included not just replenishment and additional rifle divisions and brigades, but also significant additional artillery and engineer units, which were vital for breaching the heavy German defenses. Specialized winter units included three ski brigades and four aerosleigh battalions. To ensure the Soviet forces had air superiority, which they had lacked in the previous offensive, the air strength in the area was increased to a total of over 800 planes, predominantly fighters. Large tank forces could not operate well in the swampy terrain, so the tank forces were used primarily as battalions reinforcing divisions or slightly larger brigades, which were to operate independently. Originally the operation was due to begin on January 1, but poor ice conditions on the Neva caused the offensive to be delayed until January 10–12. 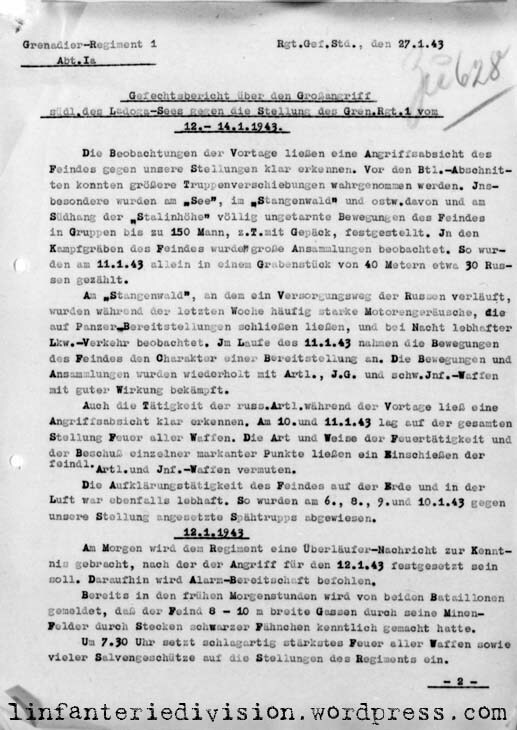 A number of measures were taken to prevent the details of the operation being revealed to the Germans. Only a limited number of senior officers were involved in the planning, all redeployments took place in bad weather or at night and simulated attack preparations were made elsewhere to confuse the German side. On January 10, the Stavka sent Georgy Zhukov as its representative to coordinate the battle. 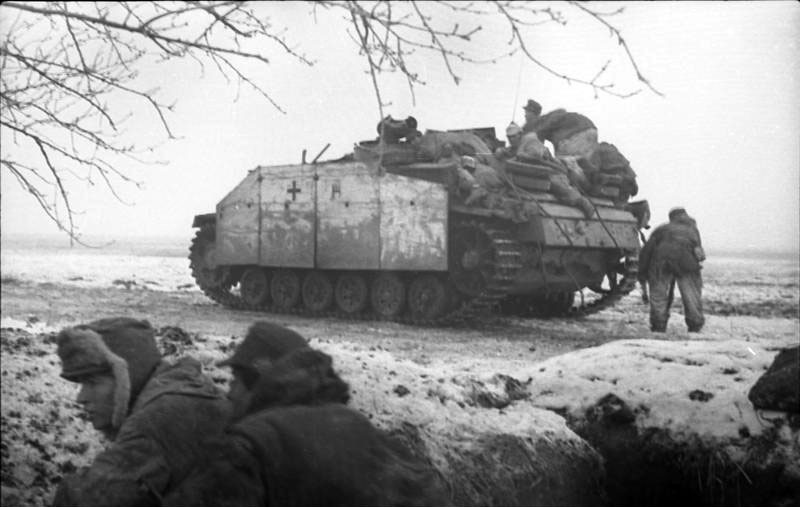 The rifle divisions occupied their jumping-off positions on January 11, and first echelon tanks moved into their advanced positions early on January 12. The night before the start of the operations, the Soviet night bombers attacked the German divisional headquarters and artillery positions to disrupt the German command and control. The bombers also attacked German airfields and communication centres to disrupt the flow of reinforcements. Operation Iskra began at 9:30 on January 12, when the two Soviet fronts began their artillery preparation, which lasted for 2 hours 20 minutes on the western side and 1 hour 45 minutes on the eastern side of the bottleneck. The Soviet attack started five minutes before the artillery preparation finished with a Katyusha barrage, to fully exploit its effects. The Leningrad Front forces achieved their greatest success between Shlisselburg and Gorodok 1. Here, the Soviet 136th and 268th Rifle Divisions with supporting tanks and artillery captured a bridgehead approximately 5 kilometres (3.1 mi) wide and 3 kilometres (1.9 mi) deep. At 18:00 the sappers constructed bridges near Mar’ino to allow second echelon troops to advance. However attacks further south, near Gorodok only resulted in the capture of the first line of German trenches. The attack further north at Shlisselburg failed. 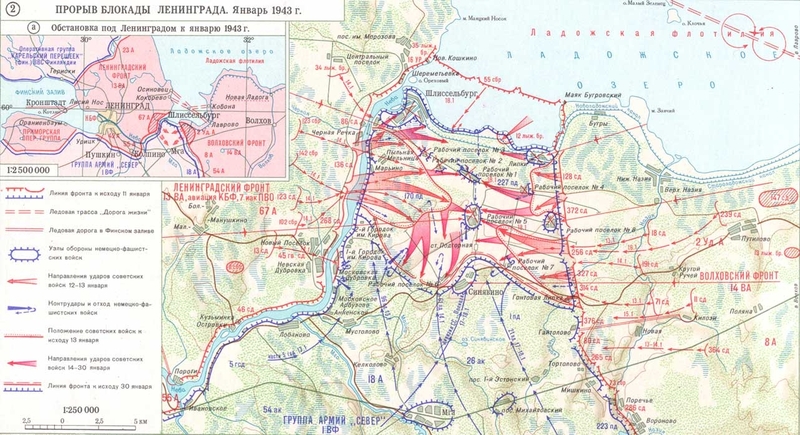 By evening, the Front command decided to exploit the formed bridgehead and troops attacking Shlisselburg across the Neva were redeployed there and started attacking it from the south. The Volkhov Front attack saw less success as the forces of the 2nd Shock Army managed to envelop but not destroy the German strong points at Lipka and Workers Settlement No. 8. The latter was an impressive defensive position with a garrison of 700 men and 16 bunkers. Heavy flanking fire from these strong points prevented any further advance, but the 2nd Shock Army penetrated the German defenses 2 kilometres (1.2 mi) between these points. Further south, between Workers Settlement No. 8 and Kruglaya Grove the advance was 1–2 kilometres (0.62–1.2 mi) deep, while even further south, the flanking attacks by the 8th Army only managed to capture the first line of German trenches. The German side reacted by deploying their reserves to the region throughout the night. One improvised battle group consisting of five battalions from the 96th Infantry Division, supported by artillery and four Tiger tanks moved to Gorodok No. 2 to reinforce the 170th Infantry Division to the west. Another similar battle group using battalions from the 96th Infantry Division was sent to Workers Settlement No. 1 to support the 227th Infantry Division. The next five days saw very heavy fighting as the Soviets slowly advanced through heavy German defences and repelled German counterattacks. On January 13, bad weather prevented the Soviet side from employing their air force. That day they gained almost no ground and incurred heavy losses. The German side, after their counterattacks had failed to throw back the Soviet troops, started further reinforcing the area by assembling battle groups using portions of divisions from the quiet parts of the front. These included battle groups from the 1st Infantry Division, the 61st Infantry Division, the 5th Mountain Division and the SS Police Division. 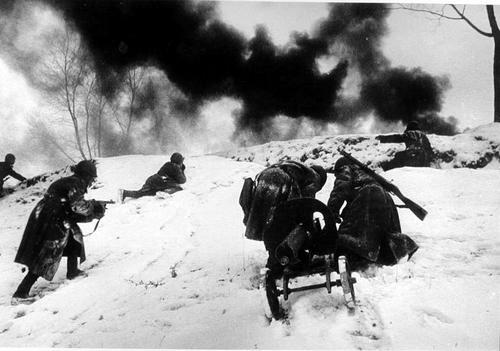 On January 14 the weather improved enough to allow air support again and the Soviet advance resumed, albeit at a slow pace. 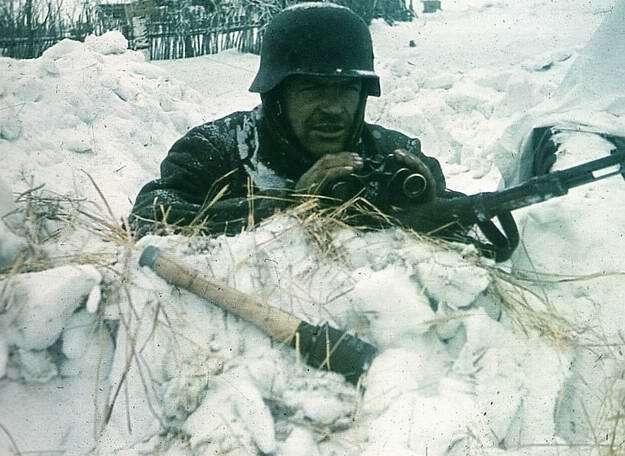 To speed up the encirclement of the strong point at Lipka, the Soviet side used the 12th Ski Brigade which crossed the ice of the Ladoga Lake and attacked the German rear lines. By the end of the day the German forces in the Lipka and Shlisselburg areas were almost completely cut off from the rest of the German forces. Throughout January 15–17 the Soviet fronts fought towards each other, capturing the strong points at Workers Settlements Nos. 3, 4, 7, 8, and most of Shlisselburg. By the end of January 17 they were only 1.5–2 kilometres (0.93–1.2 mi) apart between Workers Settlements Nos. 1 and 5. On January 15, Govorov was promoted to colonel general. On January 18, at 9:30 the lead elements from the 67th Army’s 123rd Rifle Division and 2nd Shock Army’s 372nd Rifle Division linked up near Workers Settlement No. 1, thus technically breaking the blockade and marking an important date in the Siege of Leningrad. German forces north of the settlement were cut off. Group Huhner, made up of two battle groups under the Lieutenant General Huhner, commander of the 61st Infantry Division, was supposed to hold the corridor between Workers Settlements Nos. 1 and 5 but was no longer able to do it. Later that day the Soviet forces captured Workers Settlement No. 5 after repelling a strong German counterattack. The lead elements from the 67th Army’s 136th Rifle Division and 2nd Shock Army’s 18th Rifle Division linked up to the north of the settlement at 11:45. Group Huhner became cut off too and was ordered to break out through the forested area toward Siniavino before the main Soviet forces arrived and made a breakout impossible. Group Huhner abandoned its artillery and heavy equipment and ran “the gauntlet of fire” before reaching Siniavino on January 19–20. The breakout was costly for both sides. By early afternoon, the Soviet forces cleared Shlisselburg and Lipka from German forces and started liquidating the forces remaining in the forests south of Lake Ladoga. During January 19–21 the Soviet forces eliminated the encircled German forces and tried to expand their offensive southward towards Siniavino. 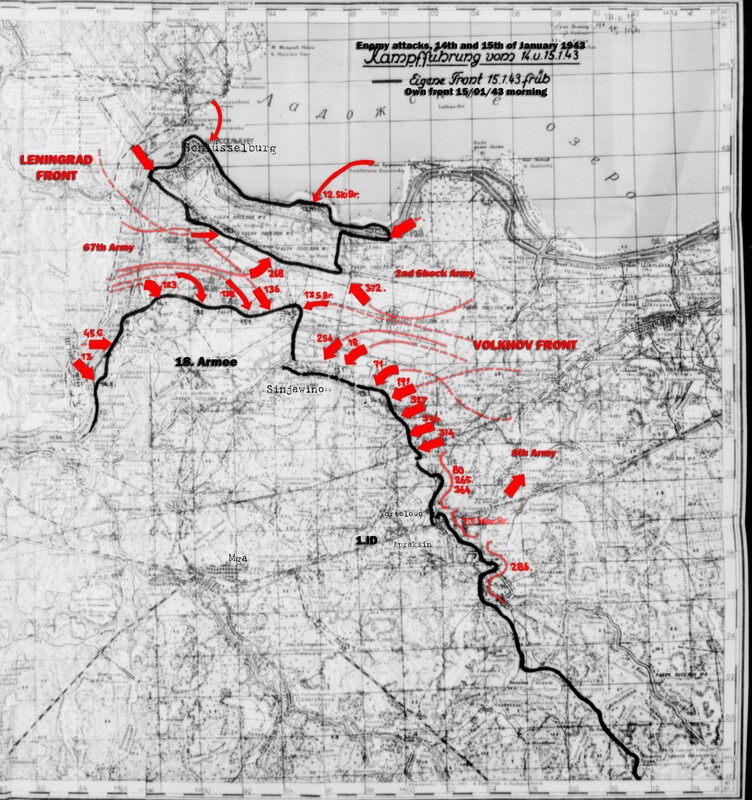 However the 18th Army significantly reinforced its positions there with the SS Police, 21st Infantry, and soon after the 11th Infantry and 28th Mountain Divisions. The Soviet forces captured Workers Settlement No. 6 but were unable to advance any further. There were no changes in the front line after January 21 as a result of Operation Iskra. The Soviet forces were unable to advance any further, and instead started fortifying the area to thwart any German attempt at re-establishing the blockade. On January 22, work started on the rail line linking Leningrad to the rest of the country through the captured corridor. The plan from the GKO written on January 18, ordered the construction to be finished in 20 days. The work was completed ahead of schedule and trains began delivering supplies on February 6, 1943. The operation officially ended on January 30. Operation Iskra was a strategic victory for the Soviet forces. From a military perspective, the operation eliminated the possibility of the capture of the city and a German-Finnish link up, as the Leningrad Front was now very well supplied, reinforced and able to co-operate more closely with the Volkhov Front. For the civilian population, the operation meant that more food was able to reach the city, as well as improved conditions and the possibility of evacuating more civilians from the city. Breaking the blockade also had a significant strategic effect, although it was overshadowed by the surrender of the German 6th Army at Stalingrad only a few days later. Notably, the first Tiger tank captured by the Soviets was taken during this battle. It was undamaged and evacuated by the Soviet forces for evaluation. Also the victory led to promotions for Govorov, who was promoted to colonel-general on January 15, and Zhukov, who was promoted to marshal of the Soviet Union on January 18. In addition Govorov and Meretskov were awarded the Order of Suvorov 1st Class on January 28. The 136th and 327th Rifle divisions were awarded the designation of 63rd and 64th Guards Rifle Divisions, while the 61st Tank Brigade was designated the 30th Guards Tank Brigade. For the German side, the battle left the 18th Army very stretched and exhausted. Lacking sufficient reinforcements, the command of Army Group North made the decision to shorten the front line by evacuating the Demyansk salient. The salient had been held throughout 1942, despite being encircled for a few months, as it was an important strategic bridgehead. Together with the Rzhev salient (which was also evacuated in spring 1943), it could potentially be used to encircle a large number of Soviet forces. However, in the situation that had developed, retaining it was no longer possible. Nevertheless despite these conditions, the Stavka knew that “Operation Iskra” was incomplete, as the corridor it had opened was narrow and was still in range of the German artillery, and the important heights and strong point at Siniavino were still under German control. This led Zhukov to plan a much more ambitious offensive operation named Polyarnaya Zvezda (Polar Star). The operation had the aim of decisively defeating Army Group North, but faltered early on. The Soviet forces carried several other offensives in the area in 1943, slowly expanding the corridor, making other small gains before finally capturing Siniavino in September. However, the city was still subjected to at least a partial siege as well as air and artillery bombardment until January 1944, when the Leningrad-Novgorod Offensive broke through the German lines, lifting the siege completely. Most of the footage is staged, still interesting material. To the soldiers of 1st Infantry Division, the soviet offensive came as no surprise. 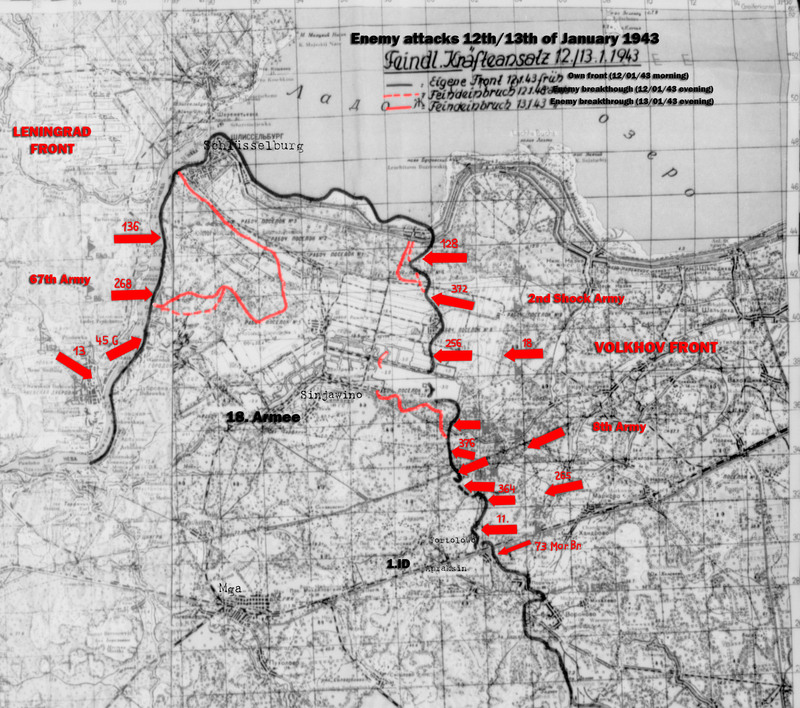 Since the beginning of January 1943 unusual enemy troop movements had been noticed, which became even more obvious on the 9th and 11th of January. Something nasty was looming ahead. On the 12th of January 1943, at 0730 in the morning, there began the second Battle of Lake Ladoga. The Divisions positions were pounded by a massive two-hour barrage from 60-70 enemy artillery batteries and rocket launchers. When the curtain of fire was lifted, four soviet divisions, one naval brigade and four enemy tank battalions, supported by ground attack aircraft and fighter planes went into the attack. Three more divisions were kept in reserve. What followed were three weeks of grim fighting with machine guns, rifles and handgrenades. A report about the fighting on the first three days of the battle was written by the commanding officer of Grenadier-Regiment 1, Oberst von Keussler, on the 27th of January. “Rod Forest” (Stangenwald), “Stalin Height” (Stalin-Höhe), Bohemian Forest (Böhmer Wald), “Strongpost Ortmann” (Stützpunkt Ortmann) and the “Pear” (Birne) are Divisional designations for certain sectors of the battlefield. When you take a look at the above map the “pear” can be found where 1st company of Grenadier-Regiment 1 is located (marked as “1./1.” on the map). “The observations made on the days before the battle had left us in no doubt that the enemy intended to attack soon. In front of our trenches enemy troop movements can be discerned. Around the area of the “Lake”, inside the “Rod Forest” and on the southern slope of the “Stalin height” the enemy moves groups of up to 150 men without any intention to hide or camouflage these movements. Inside the enemy trenches large assemblies of men can be spotted. On the 11th of January 30 enemy soldiers were counted in a trench section forty meters long. Every day in the previous week we had been hearing the sounds of tank and lorry engines from the direction of a supply road running close to the “Rod Forest”. These assemblies were targeted by our artillery and infantry guns with good effect. On the 10th and 11th of January enemy artillery begins a continuous shelling of our positions. The way the fire was directed leaves us in no doubt that the enemy is adjusting his guns. Soviet ground and aerial reconnaissance begins to increase. On the 6th, 8th, 9th and 10th enemy probing attacks are repelled by the regiment. In the early morning hours of the 12th enemy deserters report that an attack is imminent and the regiment is put on the alert. Earlier on, the battalions had already reported that the enemy had been using black flags to mark 8-10 meter wide paths through his own minefields. At 0730h a most vigorous artillery barrage of all calibers is brought down on the regiments positions. Never before have we experienced such a violent and tremendous fire. One continuous explosion, the sounds of discharge and impact seemingly melting into one. The enemy targets our main line of resistance, communication trenches, supply roads and barracks in the rear. It is obvious that his reconnaissance had done a good job. All ground-return telephone circuits are destroyed. Due to the heavy fire it is nearly impossible to eliminate interferences and to repair the circuits. This in turn forces us to rely on radio communication during the battle. In the meantime brisk movement can be observed in the enemy trenches. In front of “Strongpoint Ortmann” two enemy tanks are spotted, behind “Stalin Height” another three. All the time our own artillery and infantry guns are laying down barrage and destructive fire onto discerned enemy movements and assembly areas with good results. At 0930h the enemy, supported by 20 tanks, opens the assault on our regiments positions. 12 tanks rush forward towards the “Pear”. The remaining 8 start to attack the seam between I. and II. Batallion. These attacks are carried forward without any infantry support. Shortly before reaching our trenches the enemy tanks turn north, driving parallel to them while keeping up a continuous, suppressive fire. It is obvious that they had been ordered to keep our heads down to allow their infantry to close in. At 0940h waves of soviet infantry start to attack. Only the first wave is wearing white winter camouflage. Gaitolowo and the regiments left wing are attacked by another six tanks, this time mounted by infantry. The strength of the soviet infantry in the first waves is an estimated 600-700 men. All in all about 1500 men participate in the first attack. During the assault the enemy stops shelling our frontal positions, but continues to pound our rearward areas. As soon as the enemy infantry attacks our men start a brisk defensive fire with all available weapons which, coupled with our own artillery fire, tears huge gaps into the waves of soviet infantry. On the right wing, where some of our machine gun positions and foxholes have been destroyed by artillery fire, the enemy manages to force a small breakthrough. The point of breakthrough is at once sealed and the soviet infantry annihilated by a reserve group of 1st Coy. By 1015h this section of the line is firmly back in our hands. In front of I. Batallion 80 dead russians can be counted. 4 enemy tanks have become stuck in front of it and another is forced east by our AT fire. The reminder turns north towards II. Batallion. In front of II. Batallion the enemy assault has been stopped aswell. The 12 tanks attacking II. Batallion have been forced to retreat. 9 of them drive north, joining another 6 tanks attacking our left wing. We manage to separate the tanks from their accompanying infantry which is destroyed soon afterwards. Two of the tanks are destroyed by an AT gun of our right neighbour. Two others in close combat. Others are taken out by artillery fire and mines. All in all 12 enemy tanks lie immobilized in front of our left wing. The crews bailing out of their vehicles are annihilated. Enemy armour in the area of the “pear” now turns to attack our left wing aswell. The remains of the soviet infantry pluck up the courage to follow and get destroyed in the process. The tanks now open a concentric fire on the pickets in front of the left wing, which at once fall back towards the main line of defence. The enemy keeps on feeding reinforcements into his attacks on the regiment. All are repelled. At 1300h artillery fire begins to increase again. The enemy seems to concentrate most of it on the area of the “pear” which is the best target for a flanking attack. New enemy assembly areas close to the “Rod Forest” are targeted by our own artillery. I. Batallion gets reinforced by the regimental pioneer platoon. 3./Pioneer-Batallion 1 is put under our command and we also get reinforced by four assault guns of Sturmgeschütz-Abteilung 226. At 1330h the regiment gets attacked by enemy ground attack aircraft with cannon and bombs, without taking serious losses. By 1500h enemy infantry, supported by two tanks start to assault the “Pear” again. Shortly after passing the “Stalin Height” both tanks get immobilized by our artillery while the enemy infantry gets torn to pieces in the defensive fire of our machine-guns. By sunset the enemy artillery barrage gets weaker and soon afterwards turns into lighter harassing fire. At 1900h the enemy starts to send out small groups of up to 15 soldiers to probe our defences. All are spotted and destroyed. By 2200h it has become quiet again. Now and then the enemy artillery continues to harass our positions. Small groups of enemy infantry inside the “Bohemian Forest” get thrown out by our men. Three enemy tanks hiding with them retreat towards the russian positions but get immobilized by mines. After clearing the forest our pickets return to their old positions. Twenty destroyed and immobilized tanks are standing in front of the regiments trenches. Four of them are still manned and keep on firing sporadically. During the night they get completely destroyed by the assault guns of Sturmgeschütz-Abteilung 226.
an enemy probing attack in strength of about 30 men is repelled. At 0800h enemy artillery fire increases to a tremendous level which reaches its peak at about 1000h. At 0930 the company on the far right gets attacked by five waves of enemy infantry. The attack breaks down in our defensive fire before even reaching the wire-entanglements. At 1000h 500 soviet infantry, supported by two tanks attack the regiments left-wing and centre. The tanks get immobilized by artillery fire. The enemy infantry gets stopped about 200 meters in front of our trenches. Enemy tanks attacking from the direction of “Stalin Height” turn north when II./A.R.1 starts shelling them with smoke rounds. Apparently the enemy is shifting his forces to attack our left hand neighbour (Grenadier-Regiment 43). At 1300h enemy artillery activity gets weaker. Small groups of our soldiers are sent out to rebuilt defences and to evacuate the wounded. “Strongpoint Ortmann” gets attacked by 30 enemy infantry which get annihilated in front of our wire entanglements. Soon after sunset an assault gun of Sturmgeschütz-Abteilung 226 destroys three immobilized tanks, two of which burn out completely. Enemy attempts to recover damaged tanks from the battlefield get thwarted by our artillery. The whole day the enemy kept attacking us with ground attack aircraft. The enemy again suffered terrible losses, including two tanks. Rare photograph taken by a member of 1./Grenadier-Regiment 1 inside the “Pear” during the battle. The black dots in the distance are destroyed soviet tanks. After a quiet night the soviets continue their attacks on the 14th of January. At 0630h 100 enemy soldiers work their way towards the defences on our right. A few man even manage to reach our wire-entanglements. After loosing about 25 men killed the soviets retreat back towards their lines. At 0930h, after a short but massive artillery strike, the regimental lines get attacked by about 1000 soviet soldiers supported by 12 tanks. After a bitter fight the enemy attack is stalled in front of our wire-entanglements. The enemy suffers brutal losses. The tanks retreat back towards the soviet lines. One hits a mine and starts burning. Only minutes afterwards our right-wing gets attacked by another 250 men. Again we repel everything the russian throws against us. The left-wing gets attacked by strong soviet forces, efficiently supported by tanks. Two more tanks coming down “Stalin Height” get destroyed by artillery fire. Our left-wing pickets retreat towards our main line of defence. One anti-tank gun of 14th Coy. manages to destroy five enemy tanks. The enemy infantry attack disintegrates soon afterwards. At 1200h small groups of soviet infantry pinned down in front of our positions try to retreat towards “Stalin-Height”, but get annihilated by well-aimed rifle fire. Another attack by 250 soviet soldiers collapses in our own artillery fire before having the time to develop. The soviets take severe losses. Without using cover they cross the flat ground in front of our positions, walking straight into our defensive fire. Attacks by smaller formations of about 100 men follow at 1300h, 1325h and 1500h. Again they meet with no success. Retreating russian soldiers get taken down by well-aimed fire. By the end of the third day of fighting the all positions are firmly in our hand. 31 destroyed tanks and about 1500 dead soviets lie in front of the regiments lines. Considering the fact that the regiment was subjected to continuous shelling and repeated attacks by armour and infantry our own losses are low. Due to the courage of each of the regiments officers, NCOs and men the regiment fulfilled its duty to defend with great success. It shares this success with the comrades of II/A.R.1 (2nd Batallion, Artillerie-Regiment 1), who always had a special bond with us. The moral of the men during the battle was excellent. The enemy lost 31 tanks in front of our regiment. 17 Tanks were immobilized by defensive fire and mines. 14 Tanks were completely destroyed. “The attack started on the 12th of January 1943 at 0730 with an intense artillery barrage which soon spread out from north to south. After three hours waves of enemy infantry, supported by tanks began to advance. Defensive fire of our heavy guns and infantry weapons broke the attacking infantry, but the tanks continued to advance reluctantly. All were destroyed or immobilized by medium and heavy AT guns and in close combat in front of, in and behind our main line of defence. During the following days the attacks continued to be carried forward in the same style. The momentum of the enemy infantry assaults slackening with each attack. Enemy armour fought without cohesion. not knowing where to go, changing direction often. Obviously they missed their supporting infantry. Soviet tank crews taken prisoner reported that all tanks had been operating without radio which explains why 15 enemy tanks attacked a single company. It was impossible for them to deliver a coherent attack. After entering combat individual tanks fought courageously, effectively targeting our advanced saps, pickets, weapon emplacements and trenches with well-aimed, effective fire and inflicting serious losses. Even the crews of immobilized tanks continued to defend themselves from inside and outside their vehicles. During the defensive battle the regiment repelled all attacks directed at it by the soviet 73rd Naval Brigade and a reinforced tank batallion. The enemy lost over 500 dead. 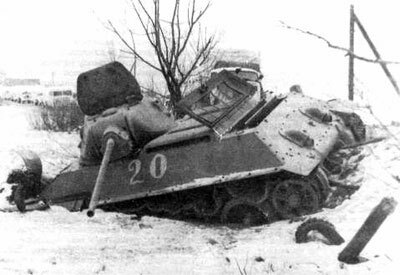 18 soviet tanks were destroyed and another 8 immobilized. Fusilier-Regiment 22 (and 1. ID in general) was considered to be an elite formation of the Wehrmacht. During the war the regiment published its own newspaper (1942-44). It was published every 4-5 months giving information on what the regiment had experienced and it also kept track of the whereabouts of former officers and NCOs of the regiment. It was given to active and former soldiers of the regiment and the families of soldiers killed in action. “We have been stationed in this area for some time now and the war had, as usual, quite a lot of surprises ready for us. Some days were quiet and uneventful, others saw grim fighting and hard work in snow, ice and meltwater. Courage, the willingness to make sacrifices, obedience, endurance, comradeship and faith are the weapons we rely on. Warfare on this front has its own face, the open landscape stretches for miles as far as the eye can see. It’s the terrain of the soviet sniper, who targets all our movements and disturbs all work done in the trenches and on the main line of defence. Our own snipers repay in kind. Our armourers cut armor plates from destroyed enemy tanks and rip out the armoured glass from shot down aircraft to strengthen our machine gun positions, the trench mirror is our best friend. The war here reminds us of the last great war in the trenches of the western front. On the 3rd of January we can observe unusual movements on the soviet side. Columns of lorries and tanks. Up to the 9th of January enemy intentions stay unclear. On the 10th and 11th enemy artillery activity increases. The Soviet is adjusting his guns. On the 11th the enemy leads a probing attack against the centre of our lines and enemy artillery fire increases further. In the night we hear the sound of engines, drunk yelling and singing on the enemy side and suddenly at midnight it gets quiet. Not a sound can be heard. Thanks for updating this site. I have found many things that have helped me find where my Grand father was killed. January 13 1943 Workman Village #5 north of Sinyavino. He was with the Pioneer Relief #24 posted there October 1942. Fritz Max Reichel. I will be in Germany this year to talk to my uncle, so if you have any more info it would be appreciated. In what Division/Unit did your Grandfather serve? Unfortunately I only know that his posting was to Pioneer Relief Troop #24, Workman Station #5 This is all the information that my mother can find. I don’t know the position. He was pronounced dead during the second battle of Lake Ladoga. Possibly January 13-18 1943. His remains have not been found. He was called up Sept42′ arrived Oct42′ died Jan43′. My grandmother had destroyed all documents years after. My mother only has one copy of a letter he sent her uncle. He describes what conditions were when he arrived. Similar to the Oct 42′ picture you posted. All the trees are stumps. You may have found also that it is difficult to read old German hand writing.I do have a news article form DDR in 1983 40th anniversary. My uncle has some notes on it. I could e-mail it. Contact me by e-mail if you like. The white background is much easier to read. Here is a copy of a DDR news paper from 1983. My uncle has made some notes regarding my grandfathers death. The white background is much nicer to read.